Thanks so much for stopping by! I hope you enjoy browsing through this site and seeing what's up at Hollyhock Quilts. Although this website is in blog form, I will not be adding other pages, so just ignore the date. Here's a bit about me just in case you're interested! My name is Glenna Hailey and it doesn't seem possible, but I have been quilting for over 35 years! I worked and taught in local quilt shops for many of those years. 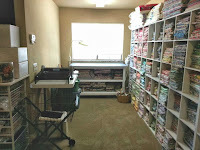 20+ years ago, I fell in love with all things vintage and in 2003 opened a retail website (Hollyhock Quilts) to sell vintage quilty things, particularly feedsacks. From there I expanded into quilt design and publishing patterns, designing feedsack inspired fabrics for P&B and then Maywood. 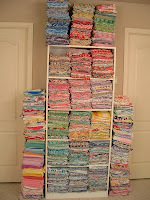 I also wrote a book on feedsacks called "Sugar Sack Quilts". These days I spend most of my time selling vintage goodies on eBay and Etsy. We are trying to travel more for pleasure and doing the things we didn't have time for when I was working so much. We have a great life and thoroughly enjoy it! You can find all my Patterns in my Etsy Shop. Most of these were produced from the fabric that I designed, but will look great in any fabric you choose! Several more Quilt Patterns will be added as time allows. There will also be Fabric and other items on Etsy from time to time, so be sure to check it out. My eBay Store will hold lots of goodies including Authentic Feedsacks, Vintage Fabric, Vintage Sewing Notions and other fun stuff to look at! I am sharing my longtime collections at this time due to the fact that we have dramatically downsized our home (so we can travel more!) and there simply isn't any space to display them. So here is your chance to find some great things to enjoy! I will be posting new eBay listings frequently on my Hollyhock Quilts Facebook Page as well as Pinterest so you can enjoy browsing there as well. On occasion I also post to Instagram under Hollyhock Quilts. 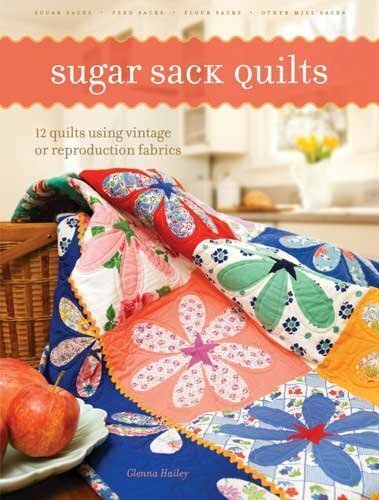 My book (Sugar Sack Quilts) is out of print, but I often see copies for sale on eBay and Amazon. My FREE PATTERNS are still available so don't hesitate to ask me to send them to you. Happy to share them whenever I can. Hopefully, more will be added as I come up with something for you. Questions? 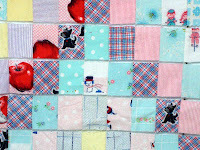 Email me at hollyhockquilts@gmail.com. I'm always happy to hear from you. In closing, thanks again for stopping by. I hope you've found something to make you smile!